The University of Development Alternative (UODA) has observed the National Mourning Day and 43rd martyrdom anniversary of the Father of the Nation Bangabandhu Sheikh Mujibur Rahman with due solemnity. The university arranged a discussion programme at its auditorium in Dhanmondi area of Dhaka on Wednesday to remember Bangabandhu and his family members, who were killed on the fateful night of August 15 in 1975. 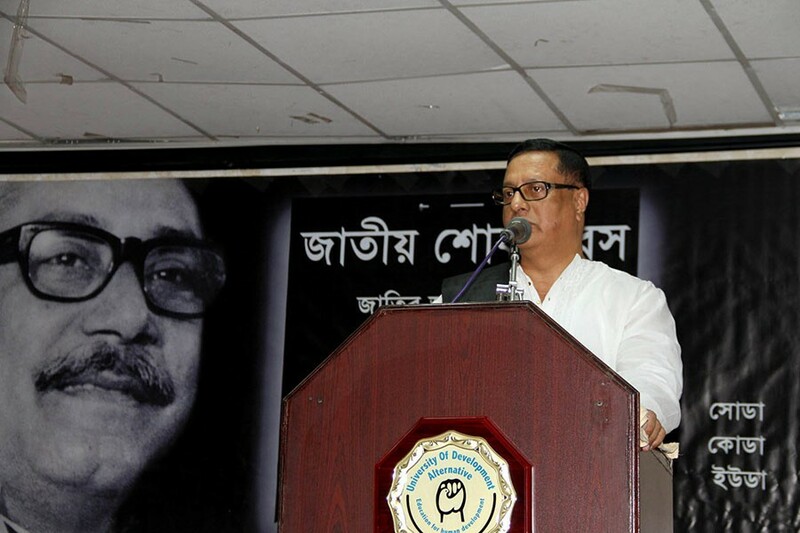 The speakers highlighted the vital role of Bangabandhu and his life-long dedication for the independence of Bangladesh, says a press release. Founder and president of UODA Professor Mujib Khan was present as chief guest at the discussion. UODA Vice Chancellor Professor Dr Rafiqul Islam Sharif, Pro-Vice Chancellor Professor Dr Ahmedullah Miah and Registrar Professor Dr Iffat Chowdhury were also present, among others, at the programme. Bangabandhu, the architect of the country’s independence, was assassinated on the fateful night of August 15 in 1975. The self-confessed killers of August 15 also killed most of his family members, friends and relatives.